Work and intensive contact with nature can help people recover from psychotic disorders, sometimes completely. Maryland was an innovator in this approach over a century ago. The state abandoned this model, perhaps due to the public's fluctuating concern for the mentally ill and unwillingness to fund treatment programs. Eventually Maryland's mental institutions were better known for abuse and overcrowding. Posted in alternative treatments, mental health, schizophrenia. Tags: alternative treatments, mental health, schizophrenia on February 2, 2017 by Art Wagner. Individuals with ADHD/ADD often perform poorly in school and in the workplace, even though they may be highly intelligent and creative. These attention issues are often inherited, with the condition appearing in multiple generations of the family. The most common treatment for ADHD/ADD is medication, but when the medications are stopped, the condition returns. Neurofeedback can be a highly effective alternative because it allows the areas of the brain that control arousal and focus to learn how to self-regulate. Neurofeedback can improve school, sport, and work performance, as well as social skills and self esteem. Unlike medication, the effects of neurofeedback training are often lasting, although occasional "touch-ups" are sometimes necessary in order to maintain the progress. In this video, a boy who had ADHD describes his experiences before and after training with neurofeedback. Contact me, if you're wondering whether you or your child might benefit from neurofeedback brain training. Posted in ADHD ADD, neurofeedback. Tags: ADHD ADD, athletics, career, children, education, family, neurofeedback on December 10, 2016 by Art Wagner. 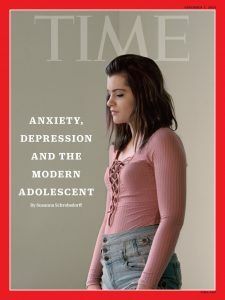 An article in Time Magazine by Susanna Schrobsdorff, Anxiety, Depression, and the American Adolescent, explores the causes of the recent significant increase in teen mental health issues. Posted in anxiety, depression, eating disorder, mental health, psychotherapy, self-harm, substance use, teen. Tags: anxiety, depression, eating disorder, mental health, parents, self-harm, social media, substance use, teen, violence on November 12, 2016 by Art Wagner. Who do you think of when you hear the term "PTSD"? Many of us associate Post Tramatic Stress Syndrome (PTSD) with veterans, and for good reason. Military service, especially in a combat zone, can lead to PTSD symptoms. Posted in PTSD, trauma, veterans. Tags: mental health, neurofeedback, PTSD, trauma on November 3, 2016 by Art Wagner. I answered, listing my fees and asking the person where they were located. Posted in social work career. Tags: scam, therapists on November 1, 2016 by Art Wagner. Military personal sometimes develop symptoms of PTSD as a result of experiencing trauma. This may include experiences such as battle, assault, military sexual trauma, on-the-job injuries, or traffic accidents. Often there have been often multiple jolts, as well as traumatic events from childhood. Posted in neurofeedback, PTSD, trauma, veterans. Tags: mental health, neurofeedback, PTSD, trauma, veterans on October 20, 2016 by Art Wagner.